Palestinian rabbi; born at Hebron about 1650; died probably at Cairo 1719. He studied under Moses Galante and became rabbi at Hebron, from which community he was sent to Europe to solicit alms. Ẓebi Ashkenazi met him in this capacity at Belgrade in 1679, and states that the name "Nazir" was given him as a Nazarite ("Ḥakam Ẓebi," No. 168). Joseph ha-Levi wrote two volumes of responsa under the title "Maṭṭeh Yosef" (Constantinople, 1717-26), edited by his son-in-law, Jeshua (Shababo). 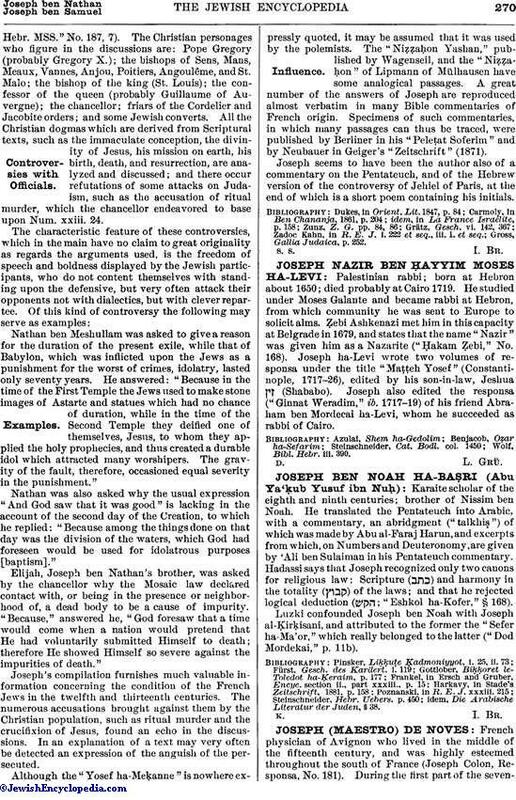 Joseph also edited the responsa ("Ginnat Weradim," ib. 1717-19) of his friend Abraham ben Mordecai ha-Levi, whom he succeeded as rabbi of Cairo. Wolf, Bibl. Hebr. iii. 390.